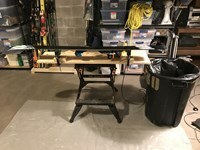 Setup a Ski Waxing Table & Tuning Bench using a Workmate Bench. Initially, I just used the Workmate Bench w/ only a 2x4 (no Pine board), but found I was too far away from the ski while tuning. 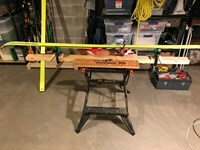 Workmate Bench w/ 2x4 Only, Ski in middle of workbench, which was too far away. 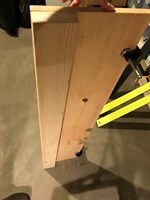 The 2x4 attached to the Pine board, allows you to easily remove or clamp it down to the Workmate Bench. 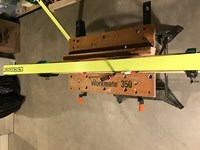 So here's a quick way and easy way to setup a DIY Ski Tuning and Waxing bench using the versatile Workmate Bench. 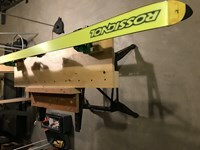 Essentially, I wanted to tune and wax my skis in my basement instead of my cold garage, but my basement didn't have a regular workbench. However, I did have an old Workmate Bench to use, I just needed to purchase a 4 foot piece of Pine wood to extend the bench longer to hold skis better. If you don't own a Workmate Bench, they are super handy and can be purchased for under $30 (depending on the model). I also had some old ski vices to use, but those can also be purchased separately or you could build your own using wood blocks, which you could then attach to the Pine board, and place your skis on the blocks. 4) Place drop cloth underneath Workmate Bench to protect floor from Wax and ski material, as well as help with quick cleanup. 5) When waxing / scraping wax off skis, place Garbage can at the end of your skis, to scrape wax into can. 6) You're now ready to tune or wax your skis and clean up is easy! 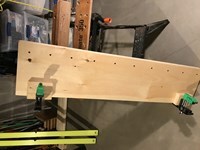 NOTE: Workmate Benches fold up, so this DIY ski tuning bench is easily portable, so whether your a ski racer who needs a ski tuning bench to tune skis on the road, or you just want to tune skis in your garage or basement, it's small enough to be moved around or can be folded up to fit in your car.